As has been the case since January, there is widespread skepticism that either Clinton or Trump would make a good president. Just 27% of registered voters say Trump would be a great or good president; 15% say he would be average, while 12% say he would be poor and 43% say he would be terrible. Views of a potential Hillary Clinton presidency are only somewhat less negative. About three-in-ten (31%) say she would be a great or good president, compared with 22% who say she would be average and 12% who think she would make a poor president. A third of voters (33%) say Clinton would be terrible as president – 10 points lower than the share who say this about Trump. These numbers are little changed since March, when about a quarter said Donald Trump would be a “great” (10%) or “good” (16%) president and about a third said the same about Hillary Clinton (11% great, 22% good). 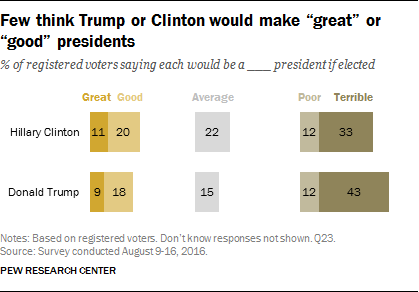 As was the case in the spring, more say either candidate would make a poor or terrible president than say either would make a good or great one. Supporters of Trump and Clinton are confident that their preferred candidate would make a great or good president. A 68%-majority of those supporting Trump say he would make a great (23%) or good (45%) president. This is similar to the positive views Clinton supporters have of their candidate: 69% say she would be a great (24%) or good (45%) president. Nonetheless, both Trump and Clinton supporters are more likely to say the opposing candidate would make a terrible president than to say their own candidate would make a good or great one. An overwhelming majority of Clinton supporters (83%) say they believe Trump would make a “terrible” president. A slightly smaller – though still wide – majority of Trump supporters (72%) say they believe Clinton would be a terrible president if elected. Younger Clinton supporters are somewhat less likely than older supporters to say that she would be a great or good president. Three-quarters (75%) of Clinton supporters age 50 and older say she would make a good or great president; 63% of Clinton backers under the age of 50 say this. Two-thirds of voters (67%) think that if Hillary Clinton were to win the presidency she would continue the policies of the Obama administration; just 27% think she would take the country in a different direction. Among the 67% of voters who think Clinton would continue Obama’s policies, more say that this would be a bad thing (37% of all voters) than say it would be a good thing (28% of all voters). Among Clinton’s supporters, 63% expect that she would continue Obama’s policies and most (59% 0f all Clinton supporters) say this would be a good thing. Eight-in-ten Trump supporters (80%) say that Clinton would continue Obama’s policies if she were to be elected, but almost all of those who expect her to continue the current administration’s policies say this would be a bad thing (78% of all Trump supporters). In September 2008, fewer than half of all registered voters (45%) thought John McCain would continue George W. Bush’s policies, if elected. At that time, a large majority of Obama supporters (79%) said McCain would continue Bush’s policies, compared with just 13% of McCain’ supporters. Majorities of voters say there is at least some chance that both Hillary Clinton and Donald Trump would make major mistakes that would hurt the country, if they were elected president. Overall, 55% of voters say there is a big chance that Donald Trump would make major mistakes as president, while another 31% say there is some chance. Just 13% say there is hardly any chance that Trump would make major mistakes that would hurt the country. Voters express slightly less concern about a Hillary Clinton presidency: 44% say there is a big chance she would make major mistakes and 32% say there is some chance. About two-in-ten (22%) say there is hardly any chance – nine points higher than the share of voters who say this about Trump. About half of Clinton’s supporters (51%) say there is at least some chance she would make major mistakes as president, while 48% think that there is hardly any chance. Trump supporters are somewhat more likely than Clinton supporters to say there is at least some chance their candidate would make major mistakes as president; 67% of Trump backers say this, compared with 32% who say there is hardly any chance that Trump would make major mistakes. Less than a month after Hillary Clinton became the first female presidential nominee of a major political party, most voters (60%) say it would be either very (41%) or somewhat (21%) important historically for the country to elect a woman president. Women (65%) are 10 points more likely than men (55%) to say the election of a woman president would be would be very or somewhat important historically. There are far wider differences in views by candidate preference. Among Clinton supporters, fully 85% say the election of a woman would be very or somewhat important, including comparable shares of men (82%) and women (86%). By contrast, about two-thirds (64%) of Trump supporters say the election of a woman as president would be not too or not at all important. This view is held by a majority of both men (62%) and women (67%) who support Trump.